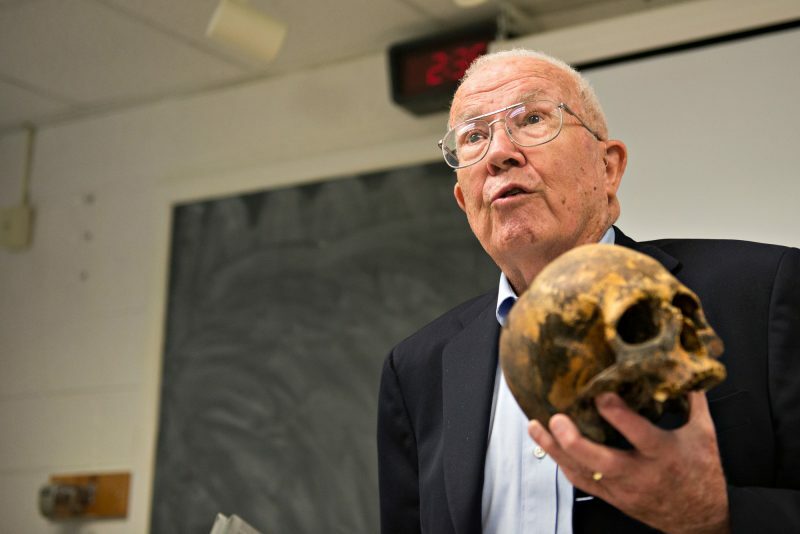 Dr. William Bass has helped law enforcement teams investigate more than 700 deaths by studying decayed bodies and bones. Some of those bones made an appearance in University of Lynchburg classrooms Tuesday. “I brought bones,” he explained, and then he removed human skulls from his box. Dr. William Bass speaks to a criminology class Tuesday afternoon. Dr. Bass passed the bones around in an American history class and explained the clues they contained about the individuals’ lives and deaths. Carter Elliott ’19 was fascinated by what Dr. Bass could tell by examining the skulls. One skull was from a person who had been shot twice. Another bore signs of having been hit with something heavy, like a tire iron. 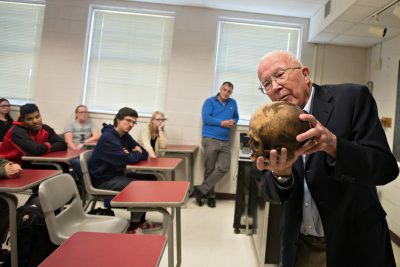 Dr. William Bass shows a skull to students in a criminology class Tuesday afternoon. Elliott was especially excited that Dr. Bass came to his class because he had missed the famous forensic anthropologist’s lecture Monday night. In that lecture, Dr. Bass told a crowd of more than 250 people about a couple of cases he had helped police solve. He explained that he selected the cases because the photos of the evidence was less gruesome than some of the cases he lectures on for students studying forensic anthropology. One was the case of a teenager murdered in 1981. Months after she went missing, a skull was found on a farm in another county. Police turned to Dr. Bass and wondered if the skull was from the missing teen. Dr. Bass confirmed the identity with the help of dental records, and then determined the cause of death by examining damage to the skull. The other case involved a woman who had died at home but whose cause of death was uncertain. Dr. Bass’s examination of the skeleton helped the police rule out foul play. Teamwork is essential, he said. “In CSI, one person has all the answers. Forensics isn’t like that,” he said. Monday’s lecture was part science, part gruesome detail, part humor. “If you make it fun they will learn the science and have fun, too,” Dr. Bass said. He became involved with University of Lynchburg earlier this year when he was searching for a place to donate the Civil War diary of his great-grandfather, who served in the Confederacy and was in Appomattox when Robert E. Lee surrendered to Ulysses S. Grant. After inheriting the ancestor’s diaries from an uncle, Dr. Bass considered several places where the book could be conserved. His brother-in-law introduced him to Greg Starbuck, director of Historical Sandusky, the house-museum that University of Lynchburg owns and operates. Dr. Bass was impressed by the home and the archeology research lab on site. But he knew he had found the right place for the diary when he learned that students were involved in hands-on work to digitize other Civil War diaries and letters housed at Sandusky.